India successfully test-fired nuclear-capable surface-to-surface ballistic missile Dhanush with a strike range of 350 km from a naval ship off the Odisha coast. 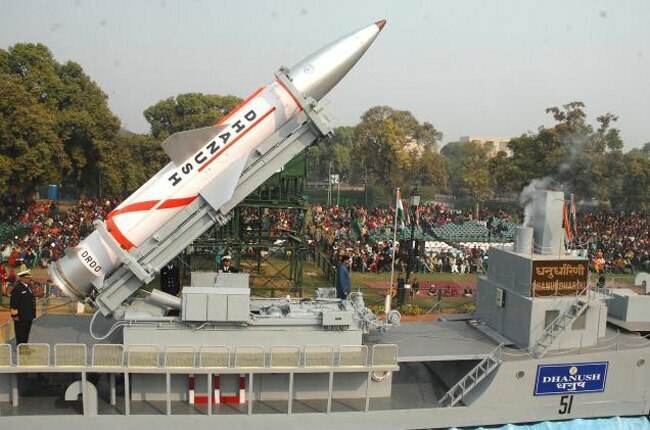 It is naval variant of India's indigenously-developed Prithvi missile.The ship-based missile was launched from an Offshore Patrolling Vessel (OPV), deep inside the Bay of Bengal to test its full range. It successfully hit the target point with high degree of accuracy. The single-stage, liquid-propelled Dhanush having 350 km range has already been inducted into the armed forces and is one of the five missiles developed by Defence Research and Development Organisation (DRDO) under the Integrated Guided Missile Development Programme (IGMDP).Dhanush missile is capable of carrying conventional as well as nuclear payload of 500 kg and hit both land and sea- based targets.